Schiffli Machine embroiders with a front thread and bobbin thread which form together a lock stitch, similar to that of a sewing machine. The Schiffli machine is a variation of the sewing machine. It embroiders with a front thread and bobbin thread (yarn at the back of the cloth) which form together a lock stitch, similar to that of a sewing machine. The front yearn is treated with a needle which passes through the goods to a predetermined point. It is then retracted slightly, and the friction of the goods holds the thread, forcing a loop to be formed. A shuttle containing the yarn which is attached to the previous stitch in the back of the goods is driven through this loop, and the needle is driven again slightly further into the fabric, to allow enough thread for the shuttle to pass through the loop. The needle is retracted while the shuttle is at its highest point and the shuttle returns to the bottom of the box. As the needle retracts, tension is applied as the big thread guide tightens the stitch thus formed. The loop is closed with the bobbin thread locked inside. Each stitch forms in the same manner. Between each of these stitches, the frame is moved, stopped for the stitch and moved again, thus forming the embroidery design. In Austria, each revolution or movement is counted as a half stitch, while most of the world counts each movement as one full stitch. The spool used for a Schiffli machine is mounted on a shaft to hold a large quantity of yarn. It is placed on an angular spindle; the yarn is drawn off its right side. This way yarn can be prevented from being stuck. 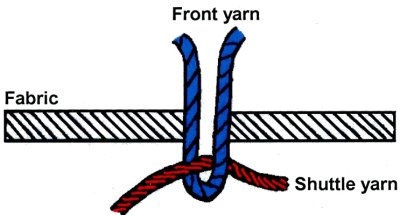 The winding of the yarn from full and heavy spools can be facilitated by using metal attachments which are placed in the middle of the tubes of the spools in order to allow a constant front yarn tension. Sometimes cones are used for big order of one design when the spool would not hold enough yarn for a long run without constant changing. In such cases, the yarn is drawn from the top end through the middle of the cone, which might be placed on the floor or might be fixed on the cone holder device. Unlike spools, cones are fixed on the cone holder device and can therefore not be turned. For each working needle, one spool or cone has to be set. 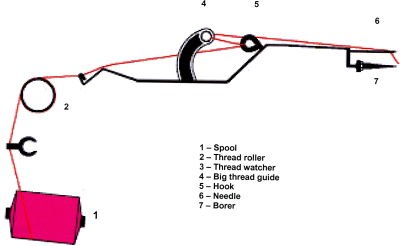 The thread starts from the spool and is winded around the thread roller 2-3 times (thread should not slip). From there it passes the thread watcher, one hook and the big thread guide until the thread finally goes through the eye of the needle.